Namana is the Malagasy word for friend, and expresses the desire of the Operation Mobilisation (OM) team to come alongside the socially and economically isolated poor of Madagascar and to give them a better future through micro‐loans. 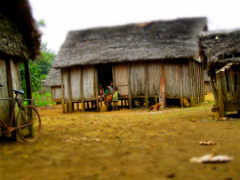 As a result of the Madagascar political crisis of 2009, thousands of Malagasy people are suffering under the yoke of poverty, in fact 80% of the population live under the poverty line. With little or no entrepreneurial skills and living on less than US$1 a day, the future seems bleak. 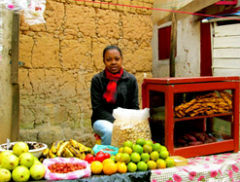 Starting the first Christian micro-finance programme in Madagascar has been a long-time dream for OM Madagascar. The participants receive an amount from US$10 to US$100 depending on their business plan. They are being equipped both financially and spiritually as they receive training in entrepreneurial skills, Biblical values and basic economics. Accountability is also facilitated through trained church members who have partnered with OM Madagascar for Project Namana. Since 2004 Bright Hope World has been partnering with Operation Mobilisation in Zambia (previously Pro Christo) to train and equip the African church for the task of missions. Yant joined Pro Christo in Kabwe, Zambia in 2003 and after completing her training joined the OM team in Madagascar. In 2012 Bright Hope World commenced partnering with her. The target group of recipients is 50 individuals living on less than US$1 a day. Yant is a local with a real passion for her people and a good team around her. There is a good balance between caring for the poor and proclaiming the good news to people who need to hear it. Being part of a wider team, OM, gives her the ongoing support and accountability she needs in a difficult place. 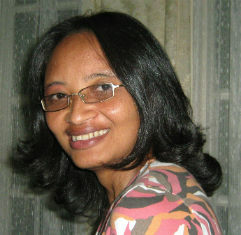 Yant was born in Madagascar into a big family with ten children. She lost both her parents at a young age and this impacted her in such a way that she came to embrace God’s love and care when was 12. She accepted Jesus when one of her neighbours shared about Him with her. As she was growing up and experiencing the various difficulties and struggles of life she learnt to understand people in need. She desires to share the gospel of Jesus Christ in its fullness – that it does not deal with an individual's spiritual needs only but addresses their lives as a whole. In 2003 she went for missionary training at Pro Christo in Zambia which helped her to see the reality with a Biblical perspective. She has also undertaken academic studies in Economy and Management. After completing her training she returned to her home country of Madagascar. The Namana project was born out of her desire to alleviate poverty. She feels people have to understand that poverty is not only about economy but also broken relationships. Her long-term vision therefore is to help people have restored relationships with God, themselves, and their neighbours. The vision is to come alongside the socially and economically isolated poor of Madagascar and give them a better future through a micro‐loan programme, training in entrepreneurial skills, Biblical values and basic economics. The major strategy is based around lending people a small amount of money so they can start up small businesses and become economically self-sustaining. When Noromamy’s husband lost his job as a security guard at the bank, and they lost the middle of their three sons to cancer, it seemed all hope was lost. Her son was just 17 when he lost his life after a long battle with cancer. The family had spent all the money they had on his medical fees and were now confined to living in a tiny 6m2 house with a small yard. The family felt not only depressed emotionally, but also socially isolated from the community. They began a furniture business, but without money to buy wood, they had to charge their customers in advance for half the cost of the furniture. Often, the only wood they were able to afford was not dry enough – further driving down the cost of their product. Before receiving the loan from Project Namana it was difficult to afford a daily plate of rice for their family of four, and often they had to pay the grocer late in order to eat that day. In addition, their two sons’ school fees were no longer affordable and the costs were piling up. They also now attend the daily Bible reading and study group at their local church. Noromamy and her family have expressed a desire to grow in the Lord after having experienced His provision through Project Namana. Madame Olga is 56 years old; she has 4 children, 2 of which are still in school. 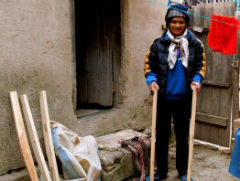 She used to wash clothes and iron for people 3 days a week, this laborious work paid only US$1.50 per day, which was less than US$5 per week to provide for her family. She began to feel the strain of her work as she was getting older, and her salary stretched thinner. When she heard of the NAMANA project at church she applied in the hope that she might be able to begin a sewing business, which would increase her income and be much less strenuous. Madame Olga was accepted to the project and offered a US$100 loan. With US$40 of the loan she was able to purchase a good second-hand sewing machine and clothing material at the market, at US$2.50/kg. She currently uses 7kg of material a week, creating 100 pairs of shorts per week at 400 ariary each (approx 0.25 USD). She explains, “I have started to make shorts and clothes for children that other people then take to the rural areas. In the rural places many people don’t buy with money because they do not have any, but they exchange it with some products they are growing like rice, potatoes, etc. Then they sell it at the closest town to pay me with money.” Through this process she is able to pay back the initial loan. Her income has increased dramatically, and the work is not as taxing, allowing her to be more healthy and rested. She has found thankfulness to God in her heart, and dreams of her business growing.